It is 45 degrees celsius in south-eastern Turkey and the population is not eating or drinking anything, even water, during daylight hours. It is Ramadan – the month of fasting. Chris and I guiltily glug water all day long (it’s 45 degrees, for god’s sake!) and instead of scowling at us, people offer us iced water, even though they can’t drink it themselves. Since arriving in Turkey, Chris has asked “inta taki Arabee?” (“do you speak Arabic?”) to anyone who says hello to us, and he has constantly been met with blank stares. 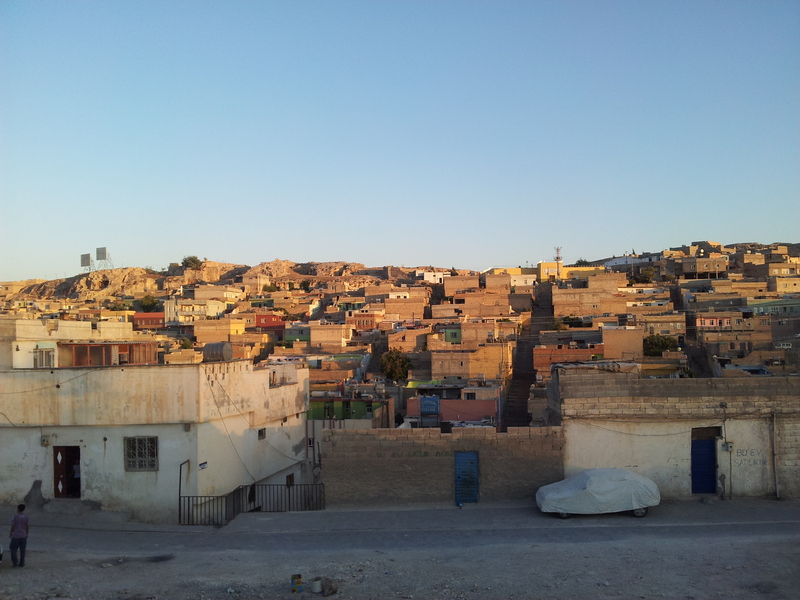 So imagine my relief, and his excitement, when we reach Urfa and we find a mix of Arab, Kurdish and Turkish inhabitants, and Chris can chat to people in Arabic. There are colourfully-dressed Arab women with tattoos on their faces and Kurdish men with traditional baggy trousers. 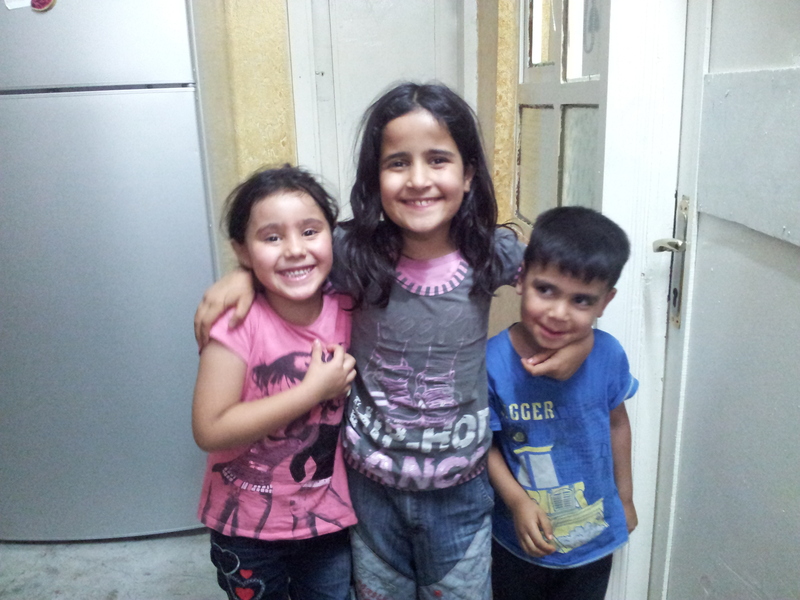 Syrian refugee kids ask Chris for money and then gleefully run to the icecream seller, then come back with cheeky but satisfied grins on their faces as they eat their lollies. 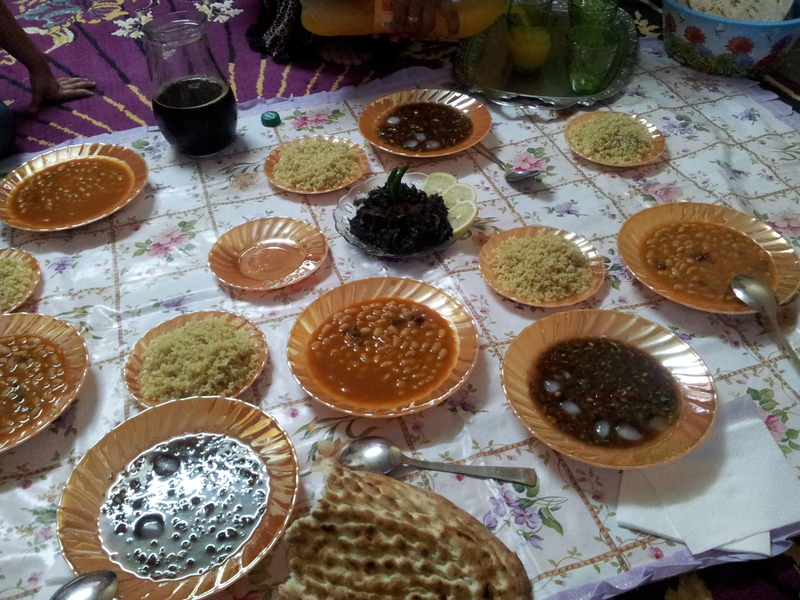 We are invited into a home and are asked by a family to join them to eat. The sun is setting and Ramadan fasting is just about over for the day. We feel lucky to get a glimpse into women’s lives, which are very often lived within the family home in Kurdistan. “If you can ask God for anything, what would you wish for?” the mother of the house asks me. “Car? House? Money? Children?” “Good health,” I reply. She asks Chris the same question. He thinks carefully, before replying in true Miss World style, “Peace”. “Insha’Allah,” says the woman. “Insha’Allah,” says Chris. “Insha’Allah,” I say. 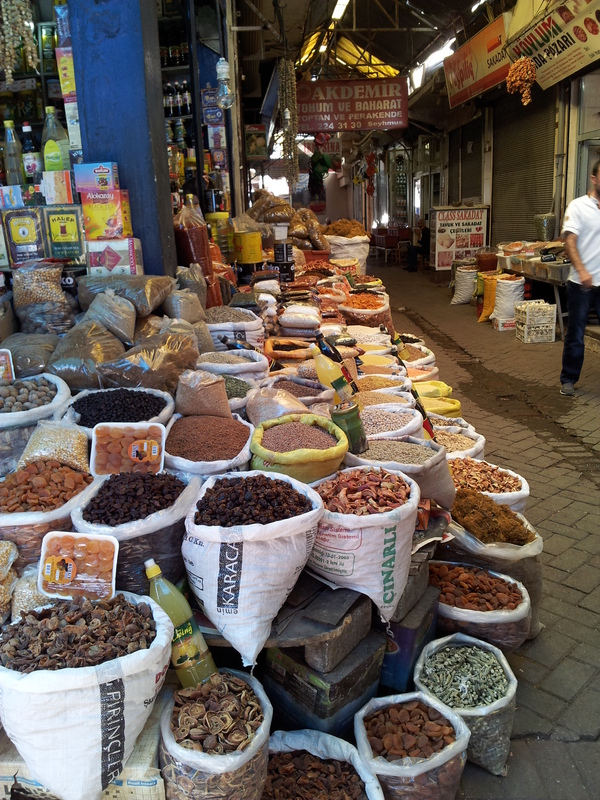 We hitch from Urfa to the most interesting city within the Turkish borders, Diyarbakır, with a lively guy called Ali, who slaps Chris on the thigh and talks loudly in Turkish to him whilst laughing: “Chris! You don’t understand Turkish! You can not understand me! Hahahahaaa! Chris will learn Turkish, insha’Allah,” he says. “Insha’Allah,” I reply. “Insha’Allah,” says Chris. Whilst wandering the streets of Diyarkbakır, a Turkish military helicopter hovers low, keeping tabs on the Kurdish population. The maze of houses in the old town gives us a chance to get away from the streets filled with men and to once again meet women and children. There are kids absolutely everywhere living in this cramped area. They play happily in the streets, and women sit outside, chatting. One woman says to me, “don’t you have children? I have seven! I will ask God for you. You will have children, insha’Allah.” I imagine that by now there must be quite a few women praying to Allah for me to have children. 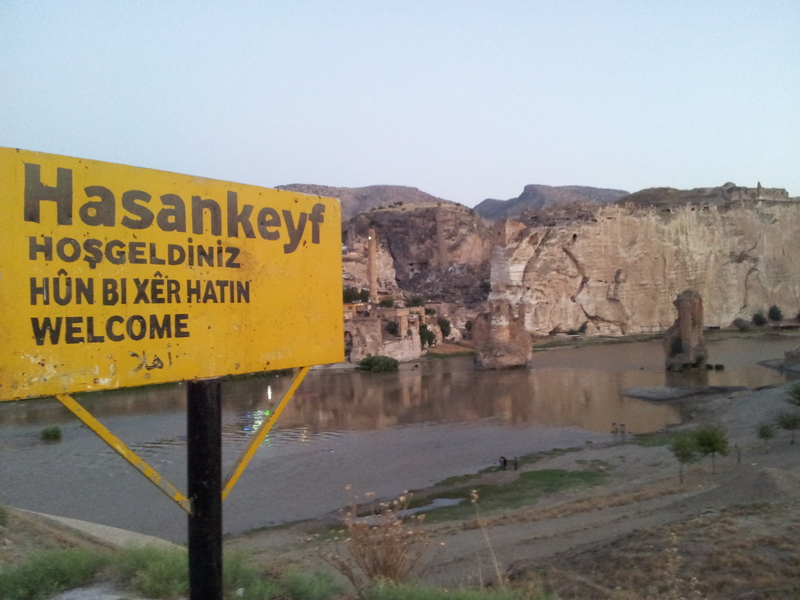 We move onto Hasankeyf. 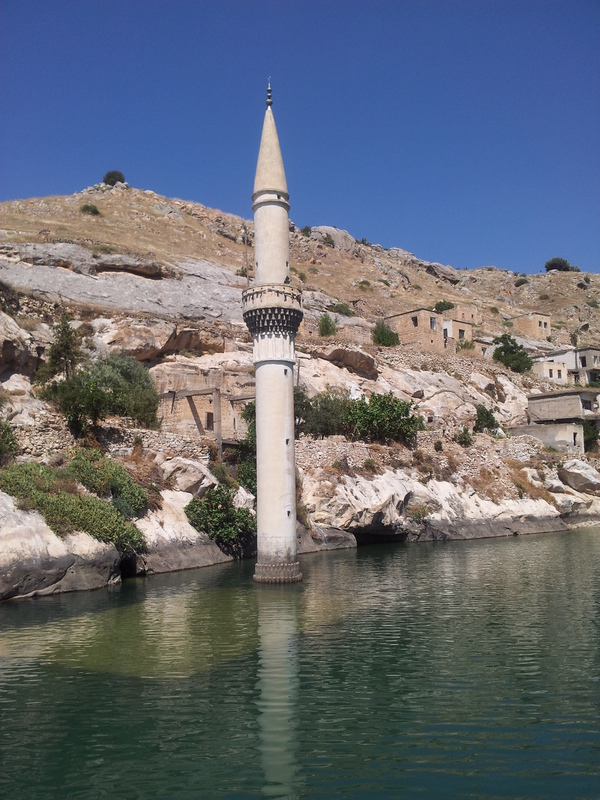 I visited Hasankeyf before, and talked about how it is set to vanish forever when the Ilısu dam is completed. The 12,000 year old village and its ancient monuments will disappear under water. 95 Kurdish villages and farms will also be submerged and up to 78,000 people will be displaced. The “new” Hasankeyf, a town of ugly tower blocks, has been built higher up the mountain. And yet, tragically, the same area already has a devastating recent history. 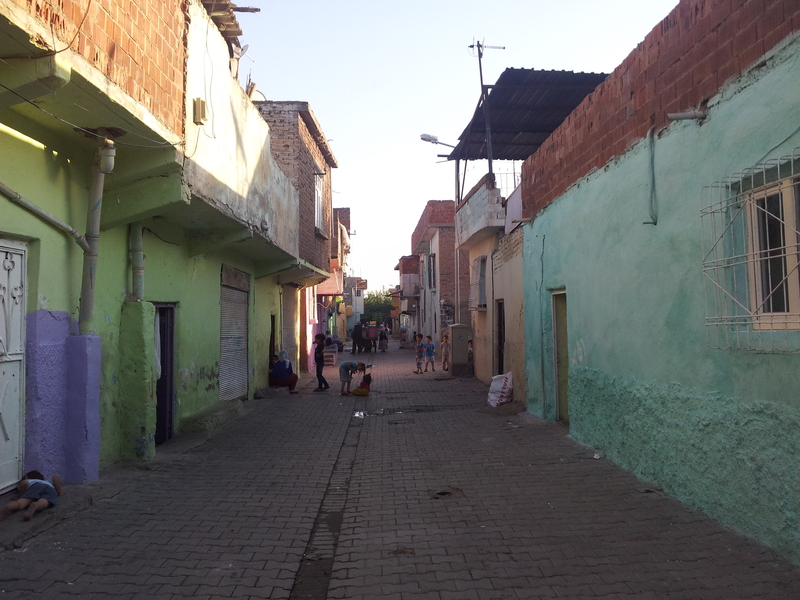 In the 1990s, whole villages were either burnt down by Turkish security forces or forcibly expelled. Thousands of people were killed or disappeared. Chris and I are taken to see some of the abandoned villages. Those who survived the brutality were forced into cities. 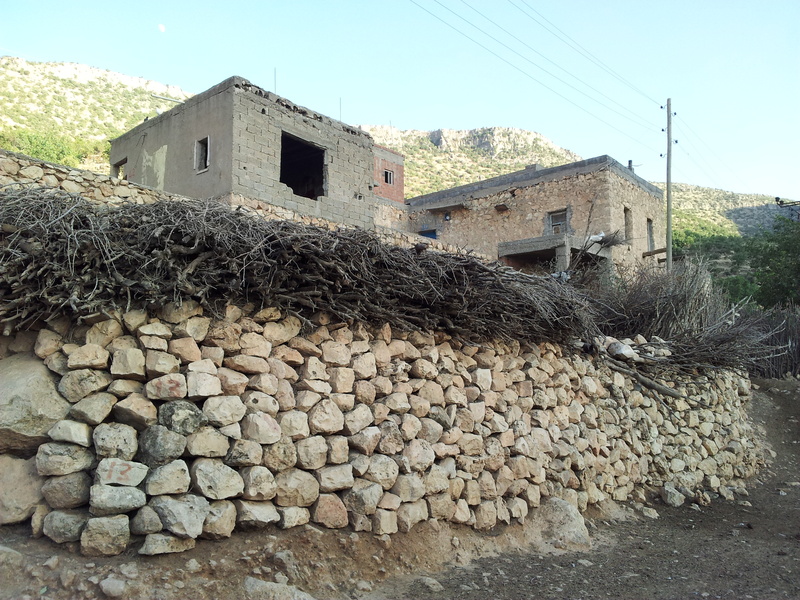 The pretext for these actions was to clear the armed wing of the PKK (Kurdish Workers’ Party) out of the villages. In reality, the aim was to expel Kurdish people from their homeland. By the mid-1990s, more than 3,000 villages had been wiped from the map. 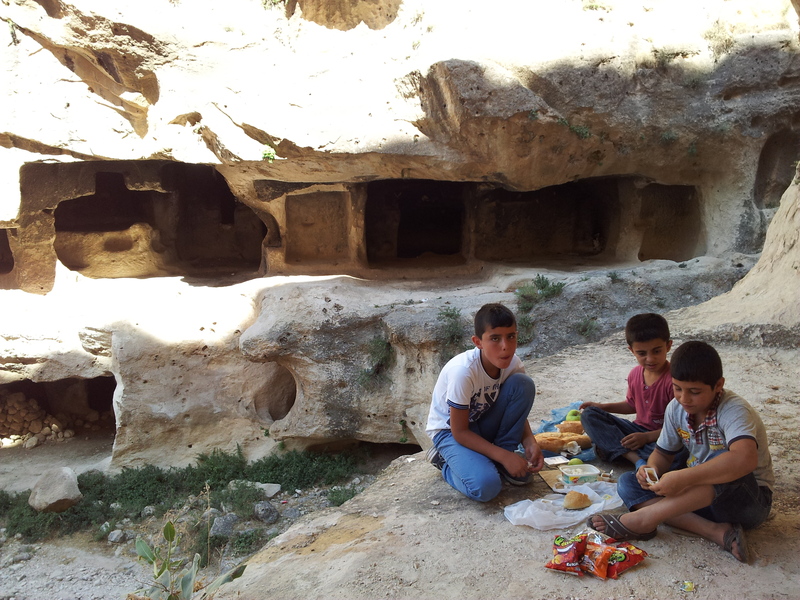 The Kurdish man who accompanies us recalls his wonderful childhood memories of living in his village. He is truly devastated: he was forced away from his village in the 90s when he was a child, and now he will live to see it completely disappear under the waters of the dam. Our curiosity takes us to a town called Halfeti. 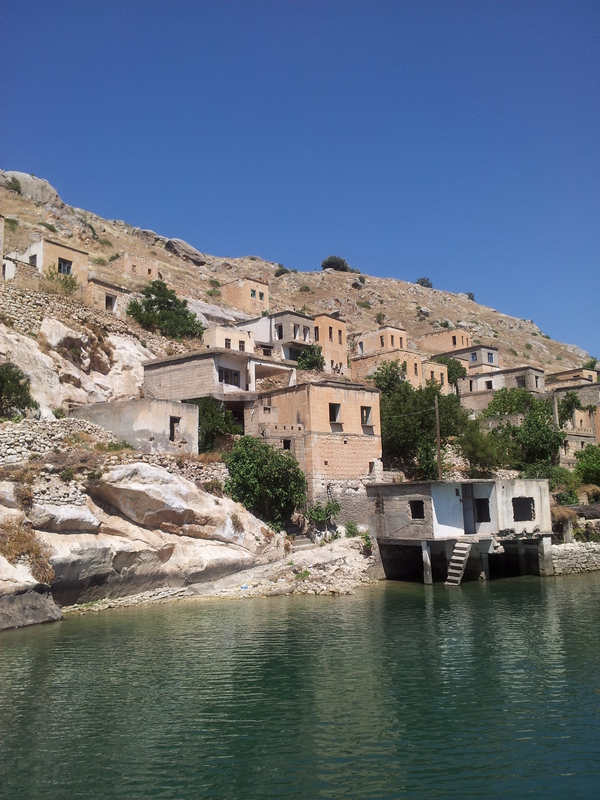 Halfeti has already succumbed to Hasankeyf’s fate, and half of it is under water because of the Birecik dam. An uglier “new” Halfeti has been built about 10km away. Around 6,500 (mostly Kurdish) villagers had to be relocated as their houses disappeared under water. As we drive around the area, it is clear that traditional farming has been replaced by industrial agriculture. In the nearby town of Birecik, shops now sell evil corporations’ pesticides and I have to wonder just how many locals benefit from this transition from pistachio orchards and animal herding to large-scale industrial farming. Savaşan Köyü is now a ghost village except for 2 families who still live there. 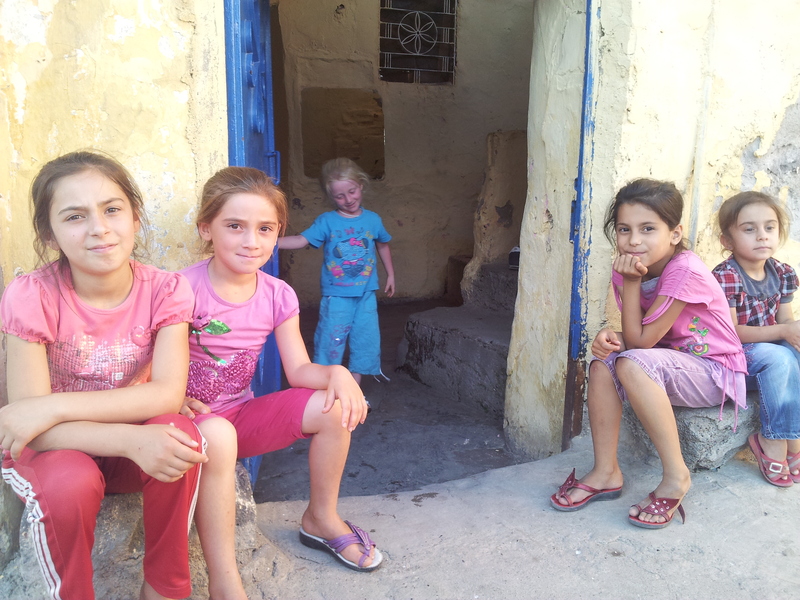 In Birecik, an old man shouts in Turkish, “hello! Which country are you from?” “England,” I reply. He ignores me and repeats the question to Chris. Chris can’t understand him. The old man tries again. Chris still can’t understand him. “Sprechen Sie Deutsch?” the man then asks, to which I reply, “Ich spreche Deutsch!” He continues to blank me, even though I can speak both languages (albeit badly) and Chris can speak neither. As we walk through Birecik, I seethe with rage over this sexism. An hour passes and I am still livid, so we decide that it is high time that we head to Greece. We hop onto a twenty-four hour bus and before we know it, we are swimming in the beautiful, turquoise Greek sea. I love all those places and its great to get you comments and humanistic approach to them! I’ve now crossed Mexico from south to north and there is so much of the same… culture being lost and overtaken! Many years ago in South America myself and my travelling companion had similar experiences with people upset at our childlessness. We quickly decided to just say we had kids and that they were staying with her sister. Eventually we ended up just adding one child to the total every time we were asked (starting again with 2 every time we got to a new town). I think we got to 11 once… which was met with great approval and a lot of smiles.